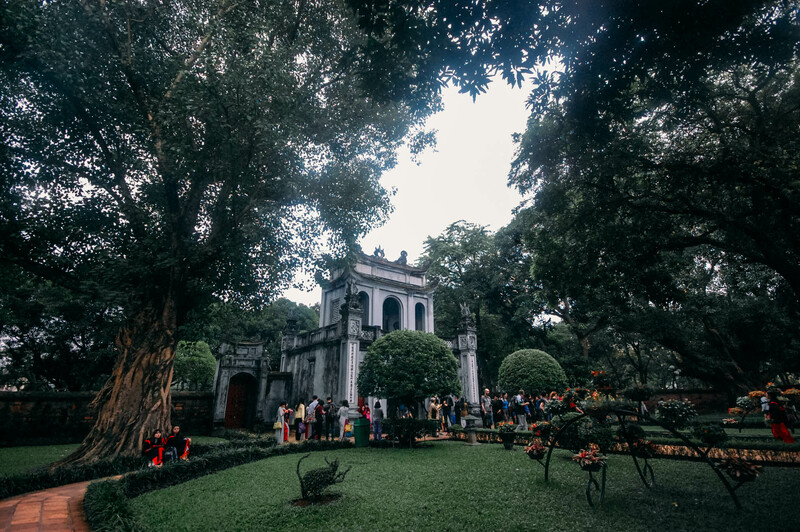 To date, Hanoi still emanates with remnants of the French rule through its centuries old gothic churches, French colonial buildings and opera houses. 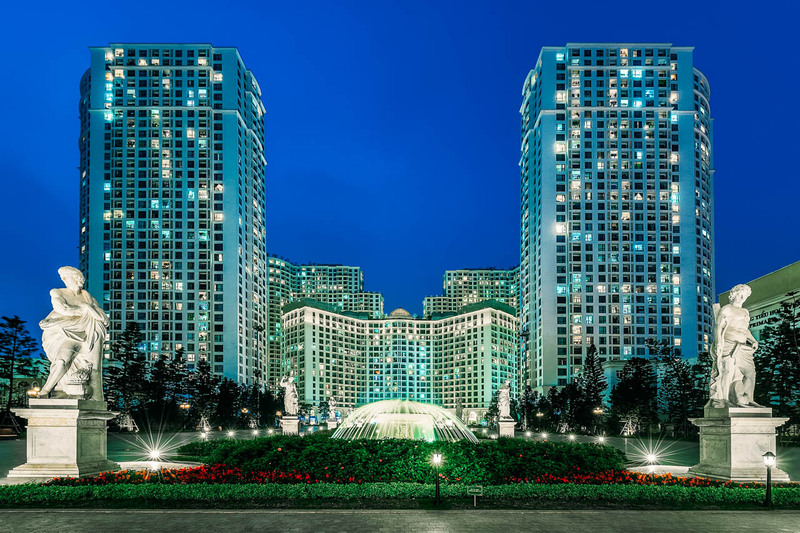 But it also exudes with traditional Vietnamese flair, making it one of the most interesting cities in the country, a blend of both Asian and European influence. 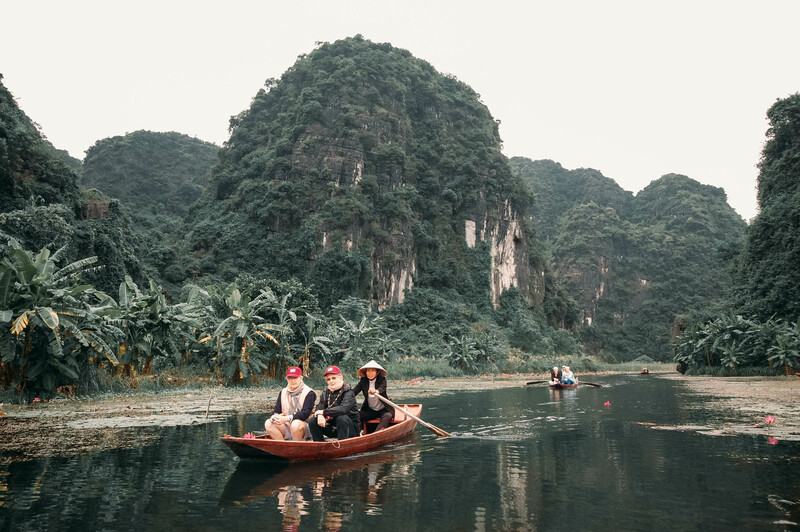 As it is the capital of the country, most airlines from several countries fly to Hanoi directly, thus, it is possibly one of the first cities you’ll visit when traveling to Vietnam. 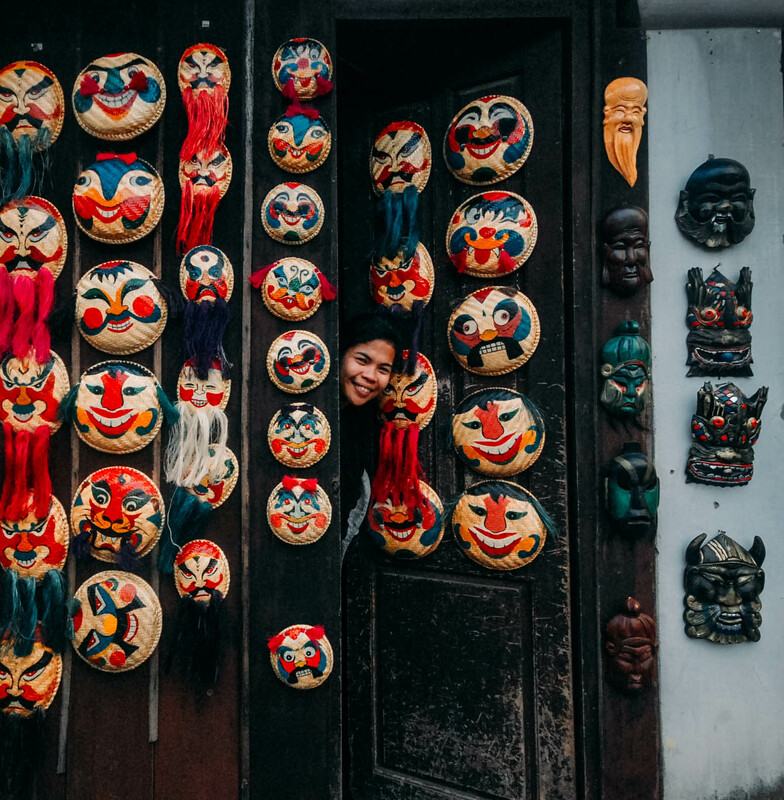 While Hanoi is often just a jumping-off point to other popular destinations in Northern Vietnam like Halong Bay, Sapa and Ninh Binh, it has its own attraction and character to flaunt. Hopefully, this Hanoi Travel Guide blog will help you in planning your trip here soon. Hanoi is the second largest city in Vietnam. But if you are a first-timer here, you will most likely stay and spend most of your time in Old Hanoi composed of 4 districts. The most famous base is the Hoan Kiem District, the heart of the city where Hoan Kiem Lake is located. The Old Quarter is where most budget and mid-range hotels are concentrated, along with hawker stalls and shops housed in French colonial buildings. Many attractions are within walking distance like the Hoan Kiem Lake, Ngoc Son Temple, Hanoi Opera House, St. Joseph’s Cathedral and Hoa Lo Prison. 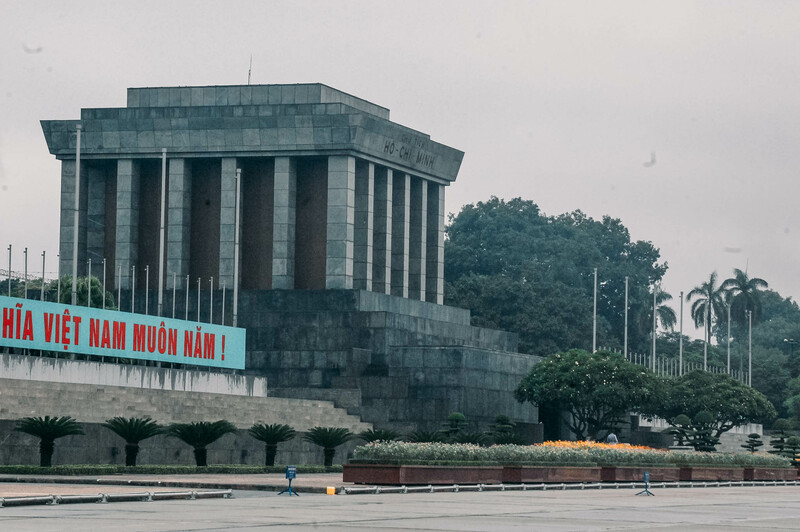 Ba Dinh District is another place that you will most likely visit as this is where you will find Ho Chi Minh Mausoleum and the One Pillar Pagoda. Bordering Ba Dinh is Dong Da District where the Temple of Literature is situated. 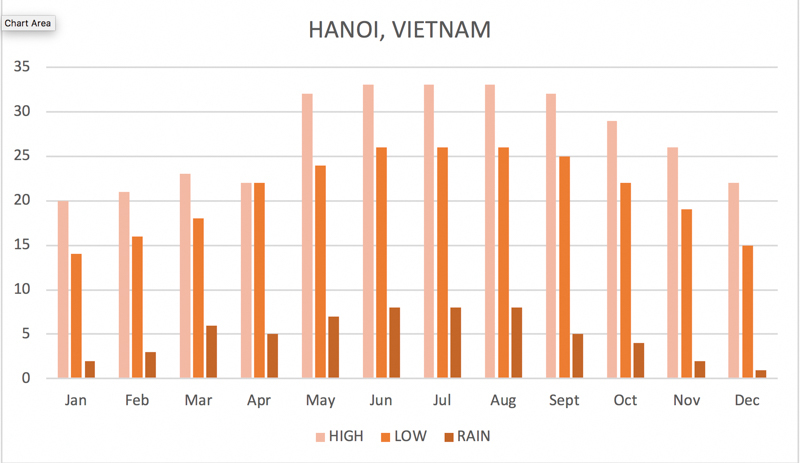 BEST TIME TO VISIT HANOI: Although Vietnam has tropical climate: hot and rainy, Hanoi city experiences 4 seasons: Winter (November to January), spring (February to April), summer (May to August), and autumn (September to October). I visited during winter, around November, and it was pretty cloudy, cold and foggy. It was also raining a lot that time hence the dark, moody photos on this blog. I had to change my itinerary; detoured to Southern Vietnam instead of visiting Sapa because of the rain. 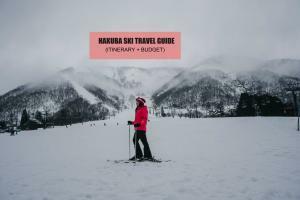 Spring would be an ideal month to visit due to the mild weather. VIETNAM VISA: No visa required for Philippine Passport holders for up to 21 days. LANGUANGE IN HANOI: Vietnamese is the local language. However, stuff at hotels, tourist establishments, vendors, and drivers can speak English. CURRENCY IN HANOI: Hanoi, like the rest of Vietnam uses Vietnamese Dong (VND). The current rate exchange is around VND 22,779 = USD 1 /PHP 51 / EURO 0.80/ SGD 1.32/ MYR 21. It’s one of the places where you exchange your Philippine peso (PHP 2,500 + or up), you’ll become a millionaire, for example PHP 2,500 = VND 1,106,370. MONEY EXCHANGE IN HANOI: If you need to exchange money, you can do so at the bank or at gold and jewelry shops. Bring USD instead of peso as it has a better rate. But since the best rates are the banks’ rate, you can save a few bucks by withdrawing from ATMs scattered around the city. IMPORTANT: Any damaged or dirty banknotes will be charged an additional 2% of the note’s face value, so best to bring new notes. MODE OF PAYMENT: Cash is widely used everywhere; some establishments accept credit card payments. IMPORTANT: Always count your change and make sure you are handing the right notes when paying because the currency in Vietnam can be confusing; there’s a lot of zeros and the color of the banknotes are almost the same. You will lose a lot of money if you pay with the wrong notes, some vendors in Vietnam won’t correct you if you make a mistake. Sadly, shortchanging tourists is quite common in touristy areas in Hoi An. In Ho Chi Minh, I was eating when a tourist hurriedly went back to the restaurant and told the staff that he made a mistake when he paid for his food the previous night. He just realized it when he counted his money the next morning. It happened to me once too, but in my case, the vendor shortchanged me. I insisted the change was wrong, and pointed to her the correct notes that I gave her. His husband ended up giving me the correct change. HANOI WI-FI/INTERNET: Getting connected online is important when traveling around Hanoi and the rest of Vietnam. While locals in touristy areas, hotels, shops and restaurants speak English, you might experience language barrier in off-the-beaten destinations. I prefer renting a pocket Wi-Fi as it is easier to set up than sim card. If you wish to rent one, you can do so through the link below and it will be delivered to your hotel in Hanoi, Hoi An, Da Nang or Ho Chi Minh City. The pocket Wi-Fi can connect up to 8 devices. What I like about traveling to Hanoi is the plethora of affordable accommodations around the Old Quarter and they are pretty stylish. Here are some of the budget, top-rated hotels by Agoda users in and near the Old Quarter. I prefer staying in the Old Quarter because it is near the restaurants, shops and some attractions around the Hoan Kiem Lake. From Manila, there are a handful of airlines that fly directly to Hanoi. I flew to Hanoi from Manila via Cebu Pacific Airlines. If coming from Singapore to Hanoi, you can fly via Vietnam Airlines or Vietjet. If coming from Malaysia or Thailand, you can fly via Malindo Air, Vietnam Airline or Malaysia Airline. Vietjet Air, Jetstar Pacific,and Vietnam Airlines have daily flights between Ho Chi Minh and Hanoi. Fare starts at PHP 3,500 + (USD 64). If you want to experience riding the famous Reunification Trains between Ho Chi Minh and Hanoi, there are trains that depart daily between these 2 cities. Take note that Reunification Trains refers to any trains on the North-South Railway Line. *Fare for children under 5 is free. The easiest and most convenient way to travel from Hanoi Airport (Noi Bai International and Domestic) to Hanoi City center is via airport transfer, you can book below, good for 2-10 persons depending on the vehicle. Recently, I like taking airport transfer as it drives me straight to my hotel with all my heavy luggage. I don’t know if it’s because I’m getting old or getting pretty lazy! Hahaha Either way, I now prefer paying a little extra for some convenience. BUS #86 – This is a new bus operating from Hanoi Airport to Hanoi City center including the bus stops in Hanoi Old Quarter and Long Bien bus station. Bus runs every 30 minutes from 6:30 AM to 11:30 PM. Bus fare is around VND 30,000/ PHP 68 (USD 1.32/EURO 1/SGD 1.74/MYR 5.12) and travel time is roughly 1 hour. if you are staying at Hanoi Old Quarter, you can alight at the bus stop in front of the Post Office near Hoan Kiem Lake. From there you can walk to your hotel or take a taxi. BUS #17 – This is the cheapest bus that can transfer you from Hanoi Airport to Long Bien Terminal in the Old Quarter. If you are arriving at the International Airport, walk for a few minutes to the Domestic Terminal. Fare is roughly VND 9,000/ PHP 20 (USD 2 /EURO 0.32 /SGD 0.52 /MYR 1.56), but the driver might ask you to pay more if you have a luggage. From the bus station, you can ride a taxi to your hotel. PRIVATE SHUTTLE BUS – Some airlines like Vietjet Airlines and Vietnam Airlines have shuttle buses to the Old Quarter from the airport. It should cost around VND 40,000/ PHP 90 (USD 2 /EURO 1.41 /SGD 2.32/MYR 7) per person. Make sure to use the meter if you are using the taxi and watch the meter! Many taxi drivers are notorious for overcharging tourists in Hanoi. This is why I recommend booking the airport transfer instead. Some of the reliable taxi companies in Hanoi are Mai Linh Taxi (Green) and Taxi Group/Taxi CP/Hanoi Taxi (White with Red and Blue). When riding a taxi, take note of the body number and contact # of the taxi operator in case you get ripped off, you can report it. IMPORTANT: Some taxis at the airport reportedly take tourists to the wrong hotel with almost a similar name as some of the popular hotels in Hanoi and you will end up paying more. Always double check if you have the right hotel to avoid this from happening. Better yet, BOOK A HANOI AIRPORT TRANSFER HERE for your safety and convenience. You may also book via Grab, fare is roughly VND 300,000 (PHP 700). Vietnam is oozing with group tours, and they are dirt cheap! That’s why whenever I’m there, I just join tours instead of doing a DIY trip. It’s hassle-free, and they have English-speaking guides, so asking for information won’t be a problem. If you want a hassle-free tour, you can book through the link below. It’s pretty affordable and will cover most of the top attractions in Hanoi. Hotel pick up is also included, always check your email for pick-up confirmation. If you are a group of 3-12 persons, you can save by hiring a car for your private tour in Hanoi and it’s pretty convenient too. You can book below, just click the link for more details. If your hotel is in the Old Quarter in Hanoi, many attractions are within walking distance including Hoan Kiem lake, Ngoc Son Temple, The Huc Bridge, Hanoi Opera House, St. Joseph’s Cathedral, Hoa Lo Prison, Long Bien Bridge and some museums. Consult Google Maps for directions or get a tourist map from the airport or your hotel. 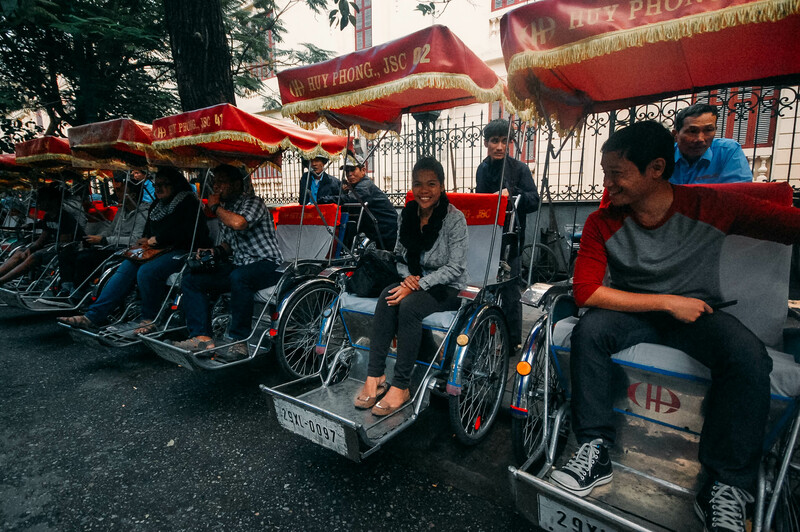 Cyclo is another way to get around and tour Vietnam, but it only covers limited distance and places. But it sure is worth a try. Our Hanoi private tour includes a cyclo tour with it. If you want to try this, you can approach a cyclo driver and negotiate the price (always agree with the price first before riding as some drivers are known to overcharge tourists! ), or book for a Hanoi Tour with cyclo tour below. For first-timers in Hanoi, here’s a list of the famous tourist attractions to help you pick the ones that you want to visit and include in your itinerary. They are typically part of the Hanoi group tours I mentioned above. 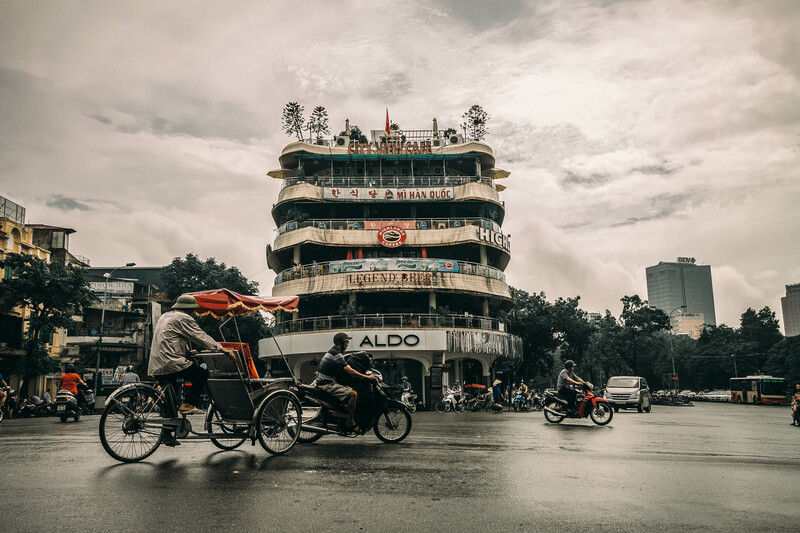 Hanoi’s Old Quarter has been thriving since imperial era, steep in history and culture and bustling with thriving hawkers, shops and hotels located in French-colonial buildings. It is also sprinkled with pagodas and temples. This atmospheric quarter is the typical base of first-time tourists in Hanoi. Back in the days, Hanoi Old Quarter used to be known for specific trades for each areas where merchants gather to sell their products. 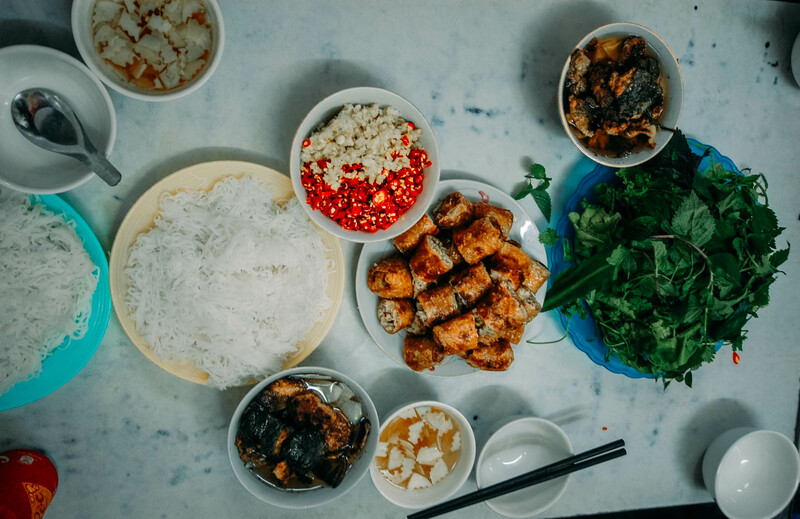 While you are here, try the Vietnamese food being sold by street hawkers wearing traditional Vietnamese hats like pho, banh mi, spring rolls and sip a glass of a strong Vietnamese ca phe da (ice coffee). Ta Hien Street in Hanoi Old Quarter is dubbed as the Beer Street and it’s not all about beer, it’s also a good place to try local food while eating it on street sides with small plastic red chairs used as both seat and table. Hanoi’s French Quarter sits on the southern edge of Hoan Kiem Lake where you can find many of Hanoi’s government buildings, embassies, luxury hotels and posh neighborhood. For those who love to shop for luxury brands, check out Trang Tien Plaza, a lively shopping area here. Probably my favorite part of Hanoi is the Hoan Kiem Lake, which is standing at the heart of it, dividing the Hanoi French Quarter and the Old Quarter. It’s a great place to hang out and take a respite from the pulsating city and buzzing motorbikes in the Old Quarter. In the middle of the lake you can see the Turtle Pagoda dedicated to the gigantic tortoise living on the lake. Early in the morning, you can catch locals practicing Tai Chi, walking or cycling around the lake. 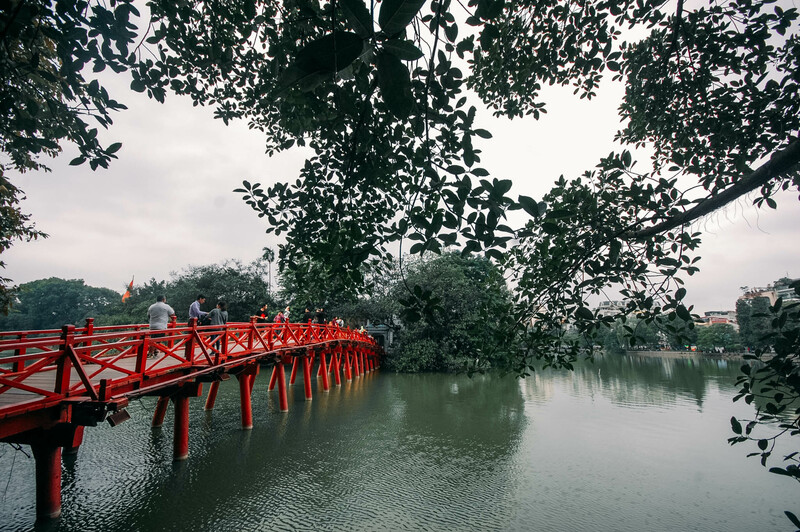 The Ngoc Son Temple can be accessed via the red wooden bridge at the Hoan Kiem Lake also known as the Temple of the Jade Mountain. This 18th century temple is dedicated to General Tran Hung Dao who defeated the Mongols during the Yuan Dynasty in the 13th-century. Temple is open from 8:00 AM – 5:00 PM and entrance fee is VND 30,000/PHP 68/USD 1.32/EURO 1/SGD 2/MYR 5. 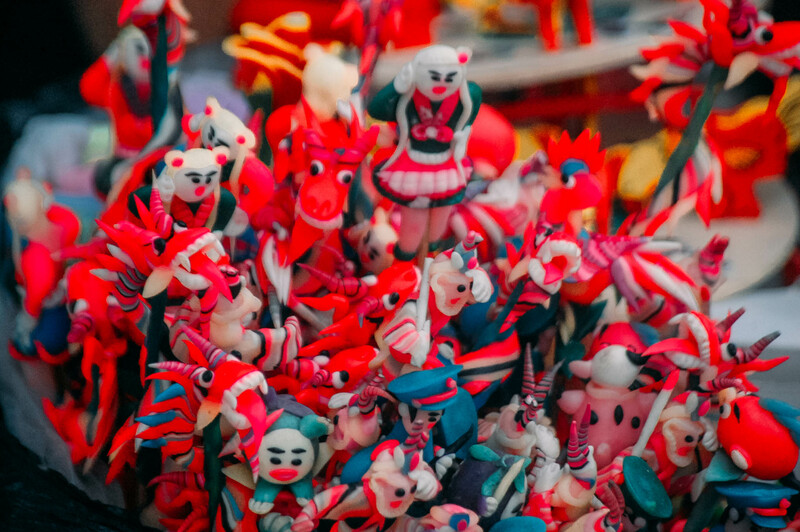 And while you are at Hoan Kiem Lake, you might want to buy a To He, a traditional toy figurine, usually in the form of animals, characters or flowers that is popular in Vietnam. It’s made of glutinous rice powder, typically made by local artisans from the countryside. Based on anecdotes, Emperor Ly Thai Thong was heirless and dreamed of the Goddess of Mercy who gave him a child. Because of this, he married peasant girl (believed to be one of his favorite concubines) and had a son with him who apparently became his heir. He then had the One Pillar Pagoda built, his way of thanking the Goddess for this event. Ho Chi Minh is the first president of the Democratic Republic of Vietnam and the founder of Vietnam Communist Party. His embalmed body is preserved and housed in Ho Chi Minh Mausoleum which is now a popular tourist spot. 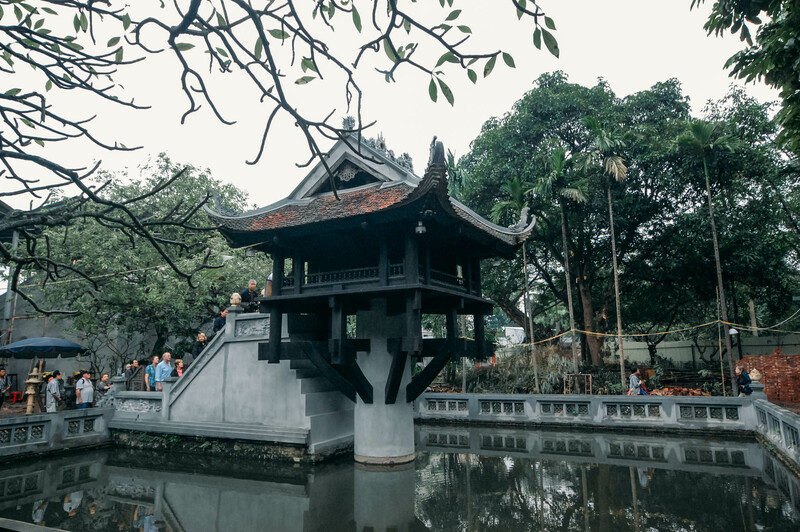 Established sometime in 1070 during the reign of Ly Thanh Tong, The Temple of Literature is built in honor of Confucius and is dedicated to Vietnam’s finest scholars and men of literary accomplishments. This temple also houses the first national university in the country – the Imperial Academy. To some the water puppet show may be boring, but I enjoyed it! As you might have guessed it, it’s a puppet show on a water. 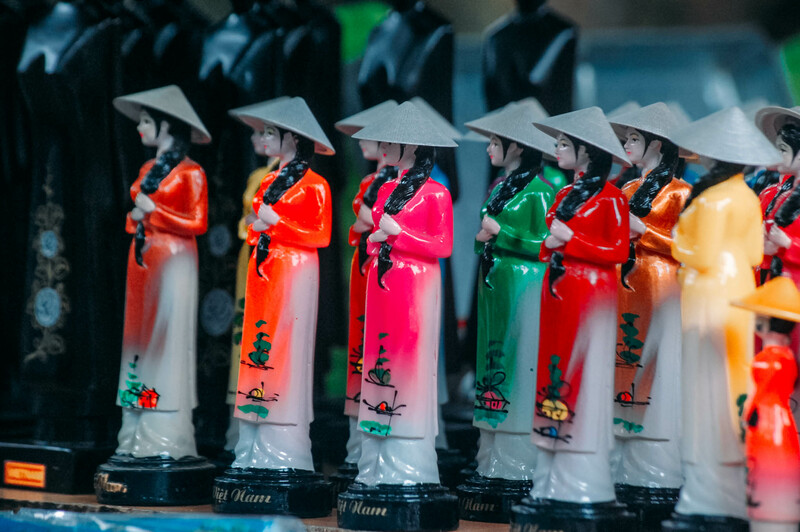 This long standing art in Vietnam is believed to have originated in the river paddies of River Delta in Northern Vietnam. 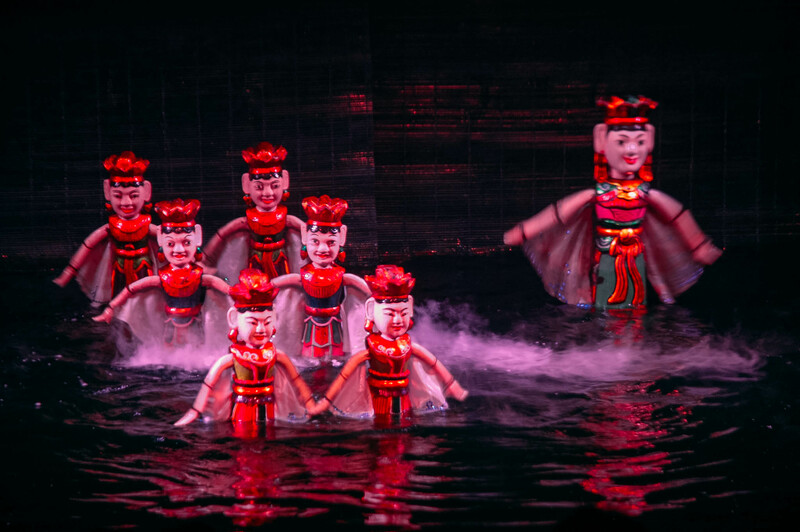 Water Puppet Show tickets usually cost between VND 60000/PHP 136/USD 3/EURO 2/SGD 3.48/MYR 10 – VND 100,000/PHP 226/USD 4.39/EURO 4/SGD 6/MYR 17. If you want a guided tour at night that includes dinner and a visit to a water puppet show, you can book below. 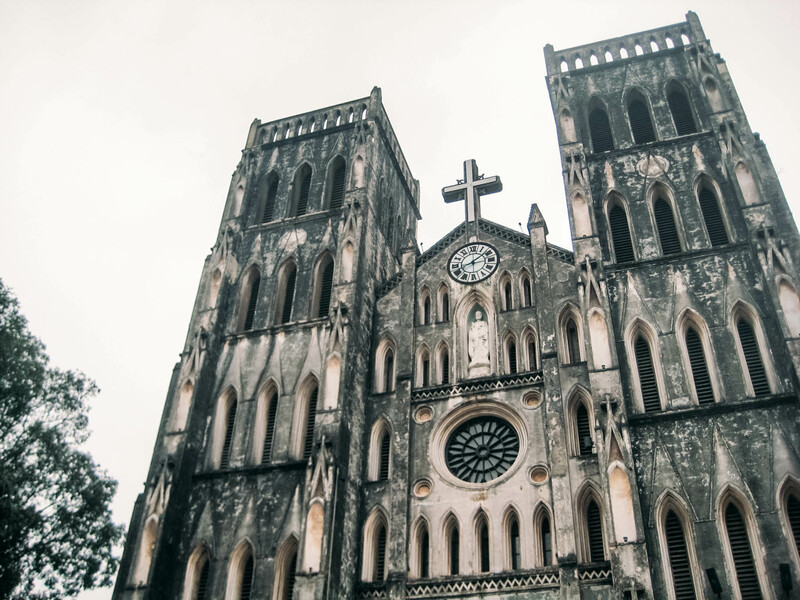 Located west of Hoan Kiem Lake is St. Joseph’s Cathedral built around 1886. It’s one of the first churches built by the French colonial government, hence its gothic features. This famed attraction in Hanoi is an opera house built during the French colonial era, sometime around the 1900s. It is said to be inspired by Paris opera houses like Palais Garnier. Is a prison for political prisoners used by the French colonizers and later for US Prisoners by North Vietnam during the Vietnam War. Today, this building houses exhibits showcasing the Vietnamese fight against the French. Though I like Hanoi’s Old Quarter and walking around Hoan Kiem Lake, I’m more excited in doing the day trips from Hanoi and side trips from Hanoi. This lively city is a good base and jumping off point for exploring its neighboring tourist destinations. And there are tons of them. Here are some side trips that you can easily do from Hanoi. Like I said above, I prefer joining group tours in Vietnam as I usually travel alone and it helps me cut the cost of my trip. Group tours are really dirt cheap and hassle-free in Vietnam! Day tour to the UNESCO World Natural Heritage Site – Halong Bay. Enjoy a delicious seafood feast onboard. Convenient hotel transfers, meals and all admission fees. Aside from Halong Bay, I recommend visiting Hoa Lu in Ninh Binh, the ancient capital of Vietnam. Hoa Lu is part of the UNESCO World Heritage Site – Trang An Landscape Complex (Trang An), along with Hoa Lu Special-Use Forest and Trang An-Tam Coc-Bich Dong Scenic Landscape. I visited Ninh Binh and stayed there for about a week, and I fell in love with the place. But if you are pressed for time, you can book a day trip from Hanoi to Hoa Lu, see link below. The tour below is really affordable since you will be joining a group tour with other tourists. This will actually save you some bucks instead of doing a DIY tour. I’ll recommend a DIY tour if you are staying there for a few days or so, but for a day trip only, the tour below is your best bet since transfer from Hanoi, tourist guide, lunch and boat cruise is already included. For those wanting to get a glimpse of rural Vietnam, you can join a tour to Mai Chu to visit the Pom Coong and Na Phon villages and have lunch with the indigenous group. 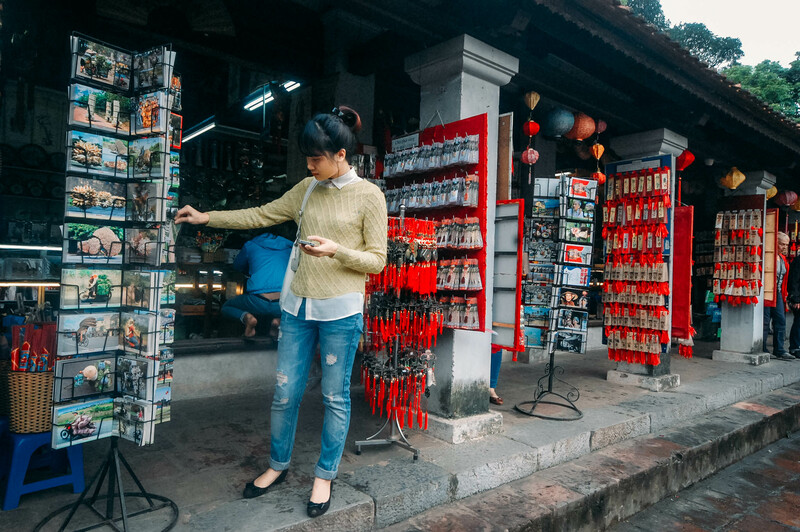 The tour package also includes a visit to the famous stilt houses in Mai Chu. If you want to experience riding along the rice paddies, this is your chance, as it is included in the tour! The tour includes a hotel pick up, so always check your e-mail for details and confirmation. Hanoi is on top of the list of cheapest city to travel to in Southeast Asia. Everything is dirt cheap here, from food, hotel, tours and transportation! Having said that, traveling to Hanoi won’t break the bank, but be careful whenever paying or accepting change, as the Vietnamese Dong is in thousands and millions, a small mistake can ruin your budget. Here’s a sample Hanoi itinerary with side trip to Halong Bay and Ninh Binh. Feel free to modify this depending on your budget and schedule. 1-2 days in Hanoi should be enough to visit its top attractions, and if you want to visit Halong Bay and Ninh Binh, allot around 4-5 days. 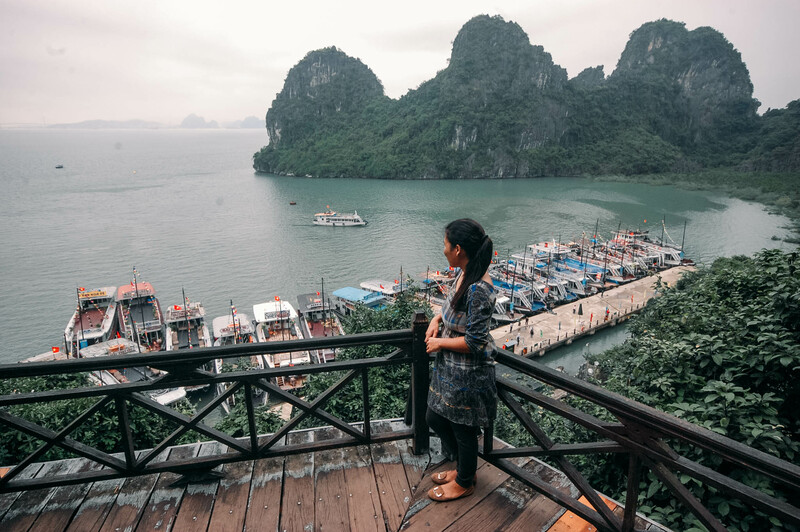 But if you are pressed for time and you don’t mind a crammed itinerary, you can squeeze them in 3 days including a day trip to Halong Bay or Ninh Binh. 12:40 PM (Hanoi TIME) ETA Hanoi. Airport pick up and transfer to Hotel. 4:30 PM End of Tour. Back to Hotel. Freshen up. 5:00 PM Snack. Buy souvenirs. 8:30 AM Start of tour. Hotel pick up. 09:00 AM Travel through the Red River Delta. 02:00 PM Continue with Halong Bay cruise. 03:00 PM Cruise stop at Thien Cung Cave. Explore Cave. 05:00 PM End of Halong Bay Cruise. Ride back to Hanoi. 08:30 PM ETA Hanoi Old Quarter. Dinner. 09:30 PM Back to hotel. Freshen up. Sleep. *This Hanoi sample budget for VND 3,710,489/PHP 8,373 (USD 163/EURO 131/SGD 215/MYR 636) is good for a solo traveler/1 person. 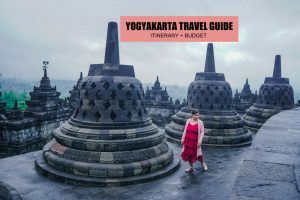 *If you are a party of 2 and you follow the itinerary above, hotel budget and food budget, it should cost you around VND 2,965,112/PHP 6,691 (USD 4/EURO 3/SGD 5/MYR 105). If you want to include Ninh Binh in your trip to Hanoi, you can add the Day 3 itinerary below. *Airfare and travel tax not included in the sample budget. 08:00 AM Hoa Lu Tour (Ninh Binh). Hoa Lu Tour. Hotel pick up. Visit the ruins of Le and Dihn ancient capital. 05:00 PM End of Ninh Binh tour. Back to hotel. Freshen up. Day 4 Fly back Home. Here’s a list of possible expenses for a Hanoi trip. Around Hoan Kiem Lake, gay men are often targeted by a friendly local who offers to take them out to a bar or restaurant where they end up paying a ridiculous expensive bill. The Old Quarter is generally safe for exploring at night, but still be careful with your surroundings especially if it is already pretty late. Some hotel staff can be quite aggressive when offering tours, if you are not keen, politely decline. If they still insist and you feel like you are being harassed, best to move to another hotel. You can BOOK HANOI TOURS HERE in advance, as the rate is pretty affordable. Some taxis at the airport reportedly take tourists to the wrong hotel with almost a similar name as some of the popular hotels in Hanoi, where they end up paying more. Always double check if you have the right hotel to avoid this from happening. Better yet, BOOK HANOI AIRPORT TRANSFER HERE for your safety and convenience. Always have cash as everything is on cash basis. Some high-end shops, restaurants and hotels will normally accept credit cards. ATMs/banks are available around Hanoi, they have the best exchange rates. Always CHECK/COUNT YOUR MONEY when receiving change or paying because it can be quite confusing! You might end up paying more than you should be! The cheapest food in the city can be found from street stalls and hawkers selling local food. When shopping at street stalls and flea markets, try to bargain as tourists are often quoted higher prices. Museums are closed on Mondays and have 2 hour lunch breaks some days of the week. Always check the open hours before paying a visit. Flying a drone in Hanoi without permission is prohibited. Don’t bring your drone in Hanoi or the rest of Vietnam unless you have a permit from the Military Defense. Many drones were reportedly confiscated at the airport, remember they have x-ray machines so they can really see that you are carrying one.